Dr. Francisco & Rev. Karen are both ordained through Wisdom Ministries in Tulsa, OK. Wisdom Ministries is headed by Dr. Nasir Siddiki & Dr. Anita Siddiki. This picture was taken on the night of our ordination. It was one of the highlights of their ministry. They also became spiritual son and daughter to Dr. Siddiki. 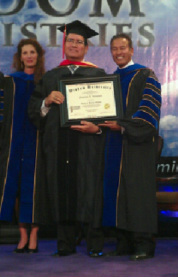 Receiving my Doctor of Biblical Wisdom Degree., the moment had finally manifested itself. After 8 long years of diligent study, guess what, Guys! It paid off. I owe so much to my Spiritual Father and Mother Dr. Nasir and Anita Siddiki. Love you both for all the encouragement given to me. Thank you for always being there to help! God Bless you both!!! Receiving my Bachelor's Degree from Dr. Nasir Siddiki at Graduation with Dr. Anita Siddiki and Governor of Oklahoma Mary Fallin. With Dr. Jerry Savelle at JSM Graduation ceremonies and it was an intense moment being in the presence of such godly people. God has been good to Dr. Pancho. From here I was on my way to my Bachelor's Degree, Totally awesome. At graduation with my dear brothers, Jeffery Swogger and Maceo Smith, Maceo sure did surprise me by coming to our graduation. You can see by the smile on everyone's face that it must have been a good lunch. What a fine bunch of people to have around me. Karen, Andrea, Dana, that's Jeff, Pastor's William and Coach! Can't get any better than these. Here I met with Apostle Frederick K.C. Price and his lovely wife Dr. Betty Ruth Price from Crenshaw Christian Center. It was a night where Apostle Price totally met my expectations with his teaching. 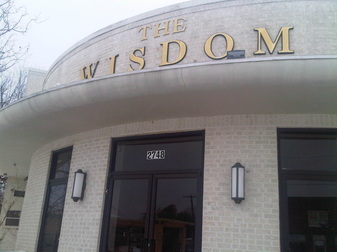 THE WISDOM CENTER Through these doors, the many seeking God's Wisdom, have entered only to find what they were seeking. God's awesome WISDOM! Rev. Jeff Swogger teaching at Pastor Roland's South Park Church in Tulsa, Ok. What a moving and inspiring night this was. Jeff is a member of our Board of Directors. Reverend Maceo Smith and I Baptizing my grand daughter Brynn Phoenix Hamilton at Eagle Mountain International Church, now that was fun. It was an honor to be present at the ordination of 42 new Spiritual Sons and Daughters at The Wisdom Center. What a powerful service this was.